Also: Ringing In The New, Cinematic Cocktails. It is with much sadness that we note the passing of Justin Allen Kinnaird, who died unexpectedly last week. Justin created By Invitation Only SLC, a semi-secret, pop-up underground restaurant, the location of which changed with each event he hosted. He was the ultimate host: a savvy and sophisticated combination of bon vivant, raconteur and gourmand. Justin’s parties and dinners were always sold-out affairs, and his guests eagerly looked forward to receiving news of the next one. We’ll miss those parties, and we’ll miss you, Justin. 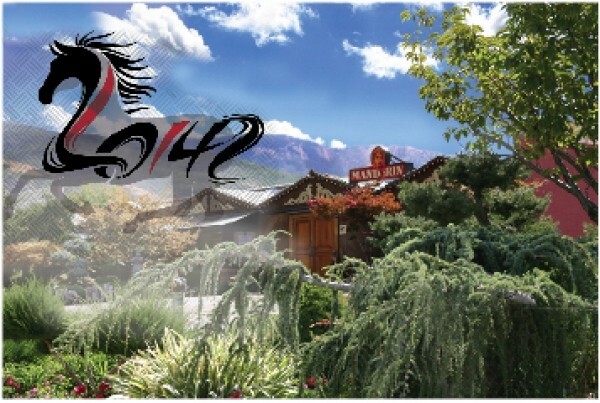 The Chinese New Year celebration at Mandarin restaurant in Bountiful (348 E. 900 North, 801-298-2406, MandarinUtah.com)—the Lunar Year of the Horse—continues through Saturday, Feb. 15. As in previous years, Mandarin’s Chinese New Year features a traditional lion dance performed by an eight-person troupe. The final performance for this year will be at 6 p.m. on Tuesday, Feb. 11. Special Chinese New Year menu items include Peking Barbecue baby back ribs, Nanking pork, shrimp with asparagus, five-taste chicken and craft cocktails such as the Gingerita and Tropicaltini, in addition to wine, Asian beer, ginger brew and China Cola. Don’t forget: wearing red brings good fortune. Gung hay fat choy! One of my favorite bartenders is Austin Craig, of Bambara’s The Vault lounge (202 S. Main, 801-363-5454, Bambara-SLC.com). This year, as in years past, he and his fellow Bambara mixologists are featuring original specialty cocktails designed with an Academy Award Best Picture nominee in mind. According to Craig, “I imagined, based on the personalities of the actors in each of the movies, what each character would most likely order in the Vault.” The cocktails, which range from $10 to $15, include concoctions like the American Hustle (Grey Goose Vodka, dry vermouth, tonic, lemon, grapefruit juice), Her (Bombay gin, lemon juice, soda, splash of French red wine) and Gravity (Buffalo Trace bourbon, Canton ginger liqueur and a dash of bitters). The nine Oscar-inspired drinks will be available in The Vault until Oscar night, March 2.